Oops, I did it again. I completely failed to post for about a month…In my defense, I have a pretty good excuse: I moved on June 22. Let me make it up to you anyway, with this delicious banana macadamia bread. This bread was made in my new kitchen, pictured below, which I share with two lovely roommates. We keep a vegetarian kitchen, so you might see a little less meat on here. Never fear, though – there will still be tons of deliciousness, and if I have any really irresistible carnivorous cooking impulses I’ll just borrow a friend’s kitchen. I’m still in Brooklyn, by the way – but no longer on the G. Which is such a relief. The new apartment has other benefits than amazing counter space – namely, Tamari! 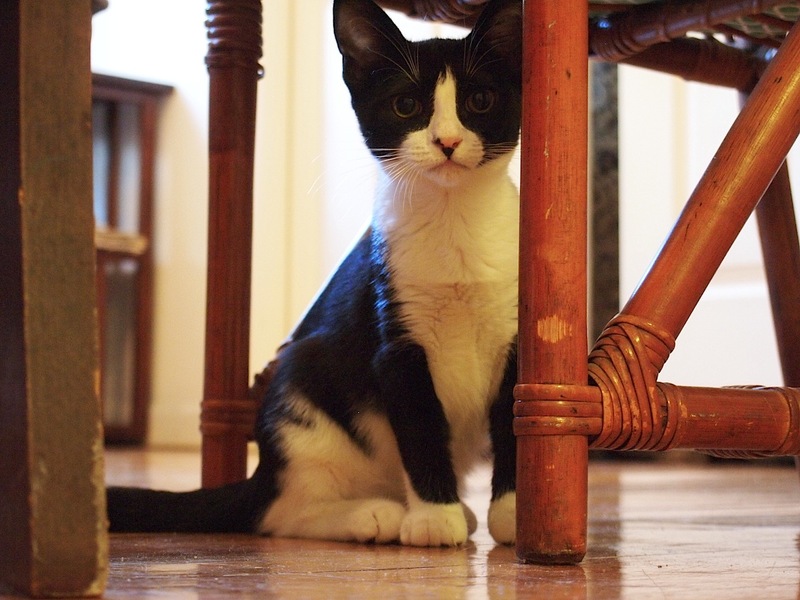 Not the soy sauce – the adorable 4-month-old kitten (pictured below). I’ve never really lived with a pet, since I was a super allergic child. My allergies have improved in the last 10 years, though, and I am now really exciting to be living with a cat (and such a sweet one!). I kind of went nuts this weekend posting kitty Instagrams. Oops. It’s been really nice living with people again. After years of wanting to move out on my own, I found when I did so that I got rather lonely. 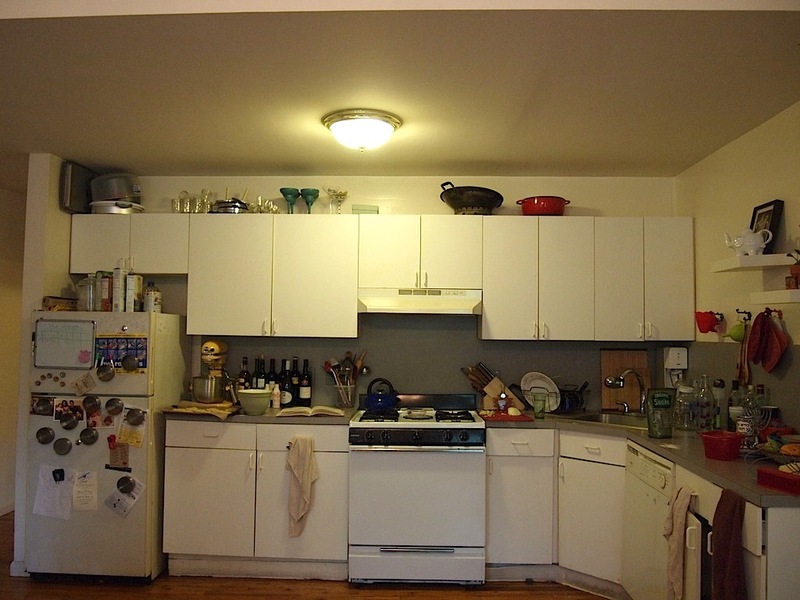 In New York, even without roommates, you’re always surrounded by other people and peoples’ noises, and I found that living amidst all this buzz but apart from it made me feel oddly disconnected. It also affected my eating and cooking habits: because I was the only one around to use ingredients up, I was less likely to buy perishables and more likely to buy things based on whether I could eat them in one or two sittings. With roommates, however, I feel far less anxiety at the prospect, say, of buying a whole loaf of bread (and feeling a gnawing, looming certainty half of it would go to waste). 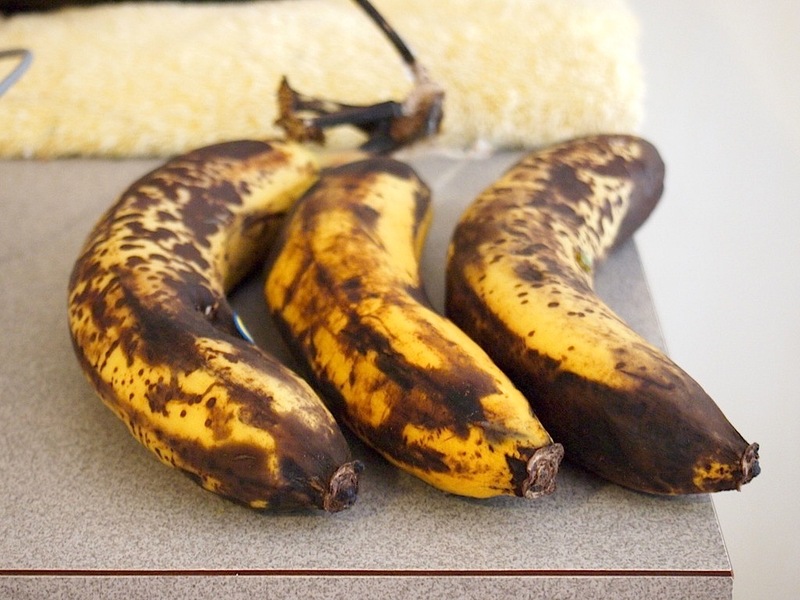 And I have unexpected opportunities – like these bananas which one roommate left when she went away for the Fourth of July weekend. By Sunday, they’d reached a perfectly disgusting stage of ripeness, and the next step was inevitable: they had to become banana bread. 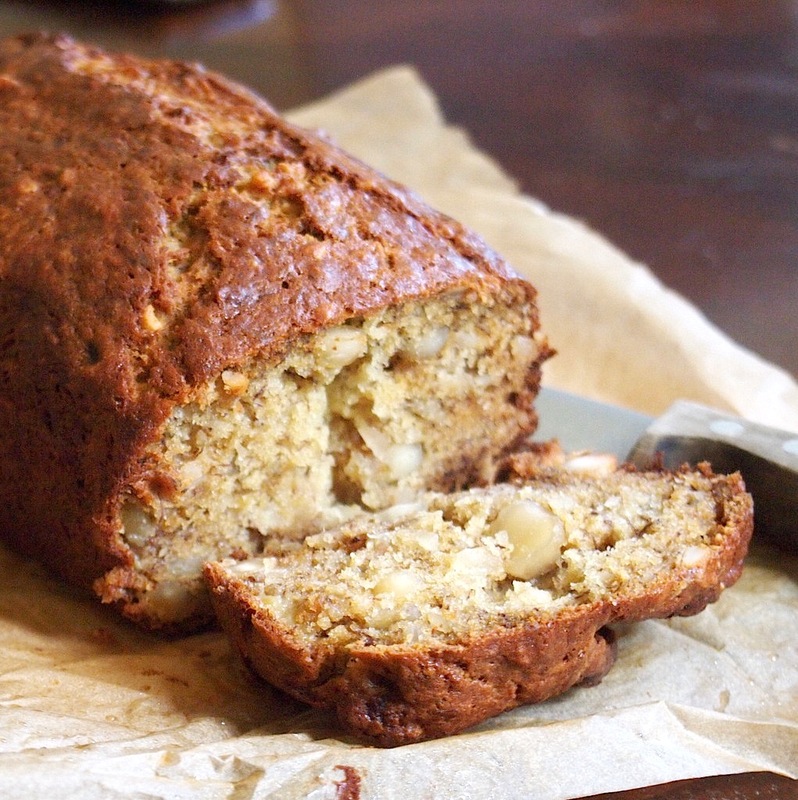 I’ve actually never been wild about banana bread – perhaps because I’m not too into walnuts. I’m actually alright with toasted walnuts (maybe I’ll try those in banana bread another day), but raw ones taste kind of soapy to me. Thankfully, in reshuffling my cookbook collection during my move, I got reacquainted with one of my favorite bread books – Bernard Clayton’s New Complete Book of Breads – and found a lovely recipe there for a macadamia banana bread. Alright now, don’t go yelling bloody murder – I know Bernard Clayton is a relatively contemporary author (though, sadly, he passed away two years ago). I give Clayton a special pass, though, because it’s obvious from his pre-recipe blurbs that he’s as obsessed with food history and traditions as I am. He got the recipe for this particularly tropical banana bread, appropriately, in Hawai’i – he tells of traveling to a hotel in Hana, on Maui, to learn about this bread from a hotel cook whose baked goods traveler could never forget. I had a lovely lazy Sunday morning putting this bread together. As you can see above, my Kitchenaid is out and standing proud on the counter – but this weekend I decided to go by hand. It was so damn hot it took the butter about 10 seconds to reach room temperature (and proceed to puddle temperature), but somehow it just felt right to move slow, play with the cat, and get to know the new kitchen. 1. Preheat the oven to 350 degrees and butter and line with wax paper a 9×5 loaf pan. Grease the wax paper as well. 2. Cream the butter and sugar together until fluffy. Add the eggs one at a time, blending well after each. Beat in the banana. 3. 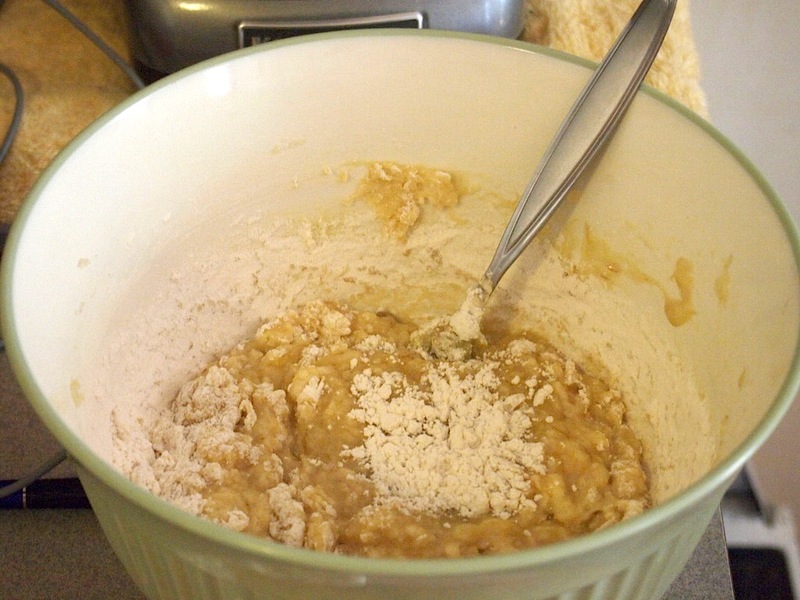 Add 1 cup of the flour, along with the baking soda, baking powder, salt, and bourbon. 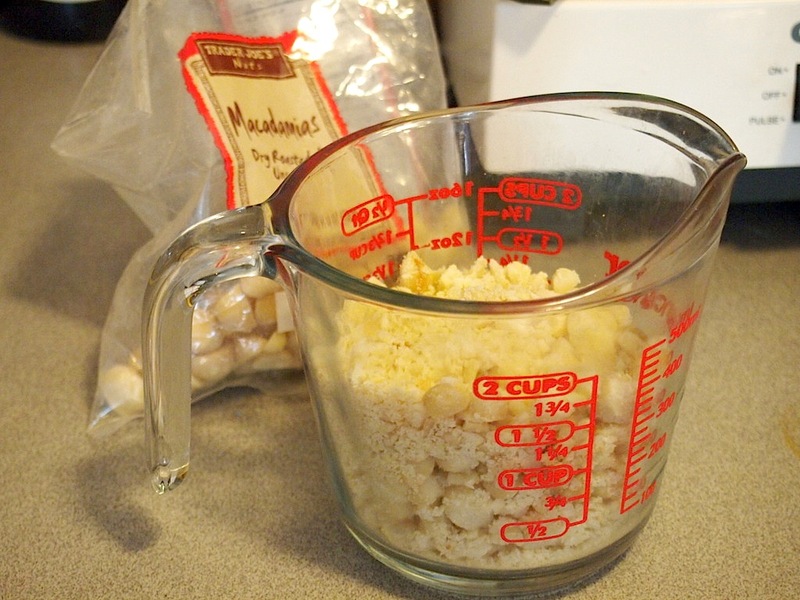 Mix this together, then add the last 1/2 cup of flour along with the macadamias (and the coconut if you’re using it) and stir together just until blended – do not overbeat the batter. 4. Bake for about 1 hour, until the top of the bread is brown and a tester comes out clean. **The original calls for 1/4 teaspoon vanilla. I thought this was lame.